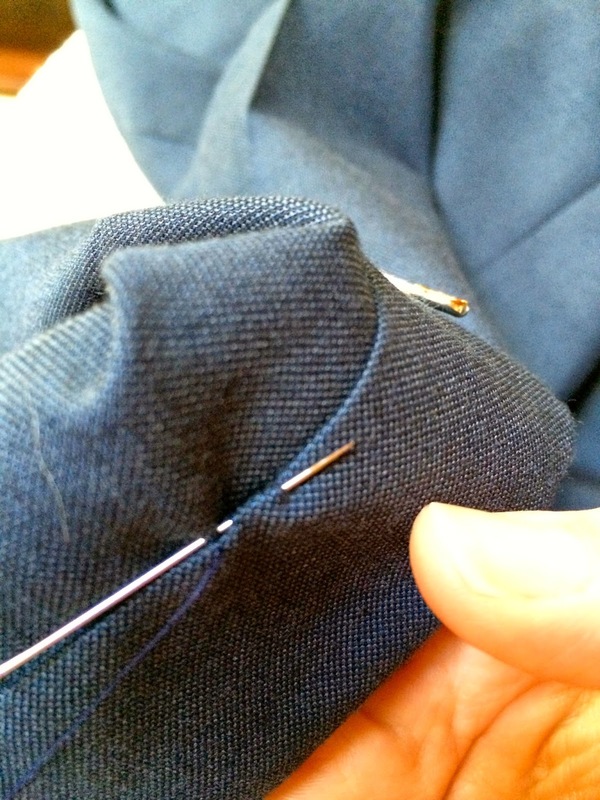 Hand sewn hemming is so easy and can be done in less than a half an hour (about the time it takes you to drive to a tailor) and for a lot less money! 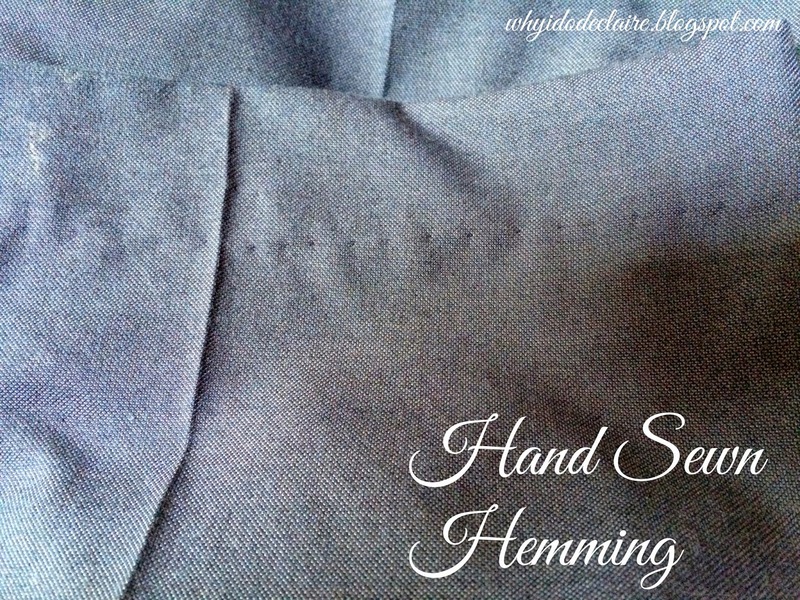 Sewing a hem by hand really looks much more professional than pulling your sewing machine out. I mean you can hardly see the stitches! It also opens up a whole new world of buying things longer than you need them which helps when sizes are limited or you are thrifting. 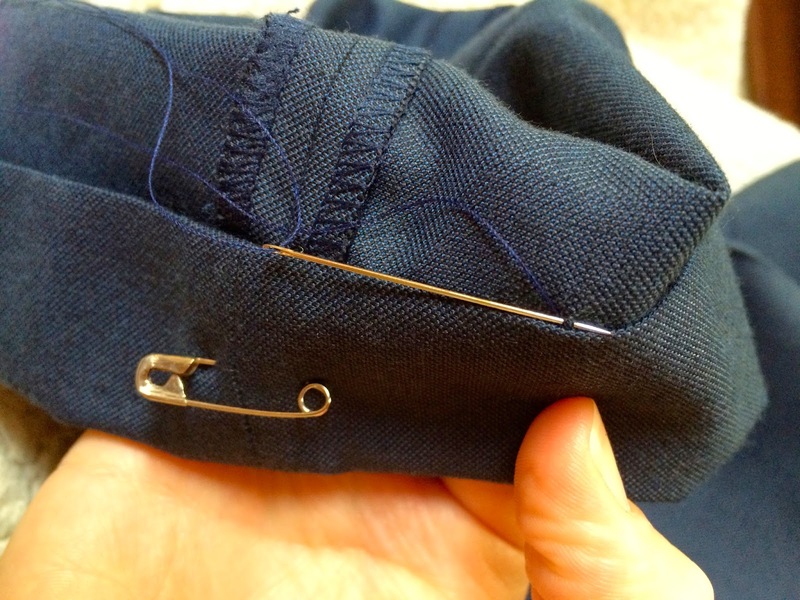 This can be done easily on dress pants, dresses, or skirts. First you need to pin the hem to the length you want. 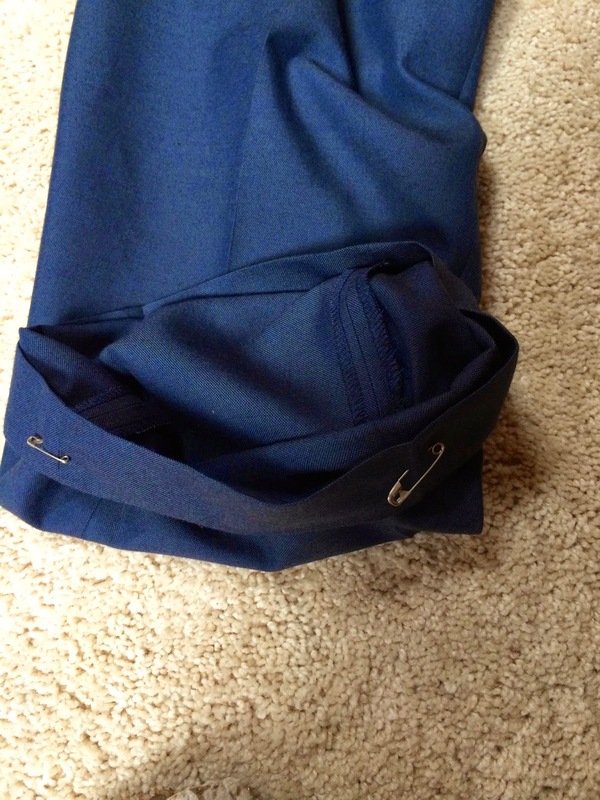 This was an easy pair of pants and I just needed to fold up the original hem once. For something you are taking more length off, make sure to measure all around leaving about 2 additional inches to fold up the hem. I fold the fabric twice so there are no raw edges seen. Pin and iron the new hem. This is what the pinned garment looks like from the outside. Turn the garment inside out or make sure you have access to the inside of the garment. Start your thread and tie it off. I like to start on the inside part of seam. I have already done a few stitches in this picture. Pick up the smallest amount of fabric you can. The smaller amount you get, the less you will see the thread from the outside. Pull the thread through. 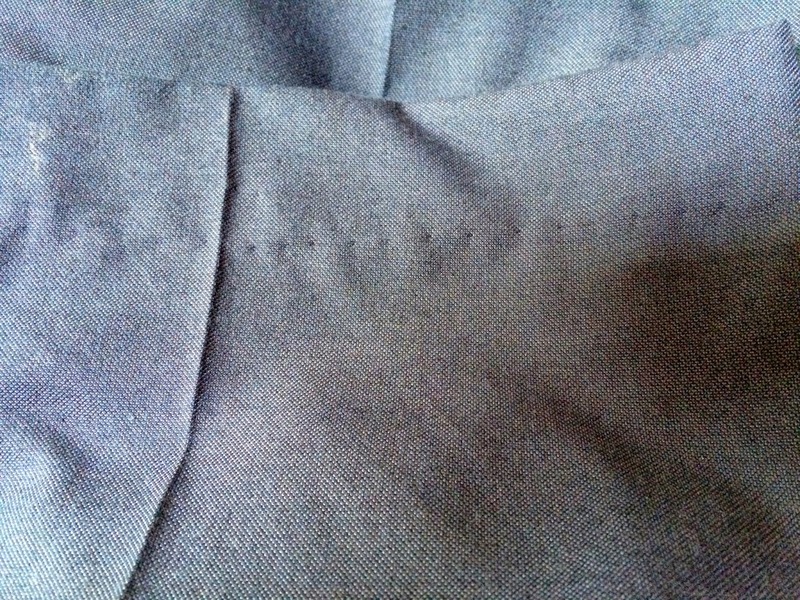 Then put the needle through the fabric folded up in the hem. It should be about 1/4" long. This will not be seen from the outside. 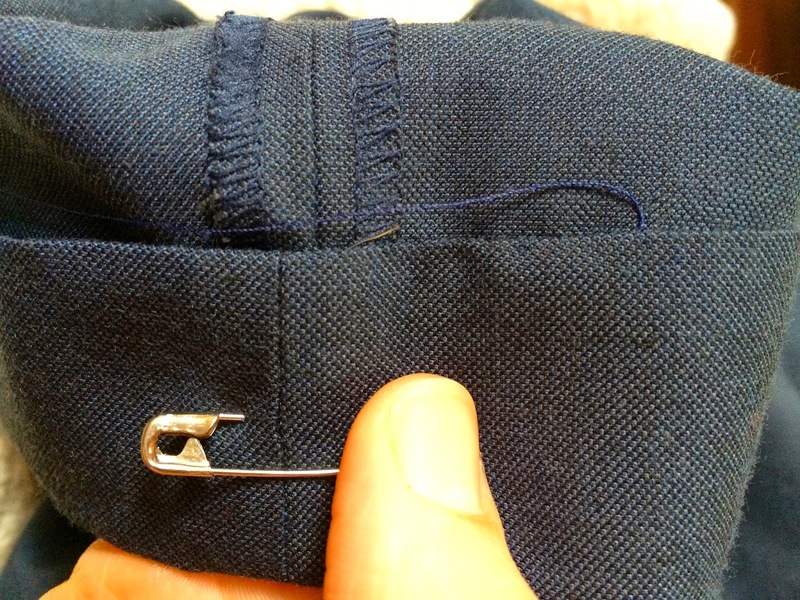 I typically combine these steps, grab a little from the pant leg, go through the folded up hem, and then pull the needle through. 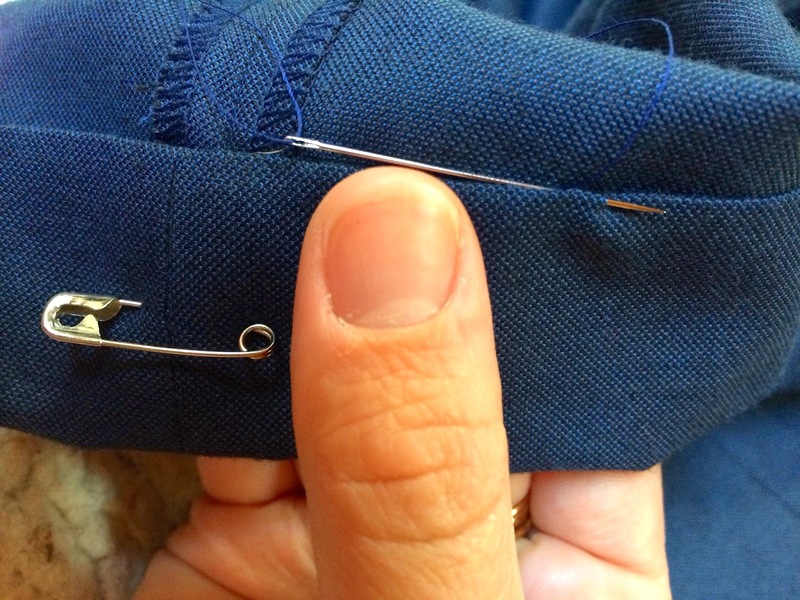 Continue these steps until you have completed the entire hem and then tie off the thread. If it is something like a dress or skirt you may have to tie off and rethread a couple times. I don't like working with thread that is very long because it can get tangled easily. For a pant leg, I can typically work with one length of thread. And this is the completed hem from the outside! Hope these have helped! If there is an easy sewing tutorial you'd like me to attempt a How To on, let me know! Don't forget to link up to Confident Twosday and enter my giveaway for a $25 gift card to Kendall Jane Boutique! looks very neat and simple. I usually roll up my jeans. I've never actually needed to hem pants (I usually have the problem where I'd like them to be longer haha) but I have hand sewn hems that have fallen out. Great steps and visuals with this. love that you have been doing these sewing post. I have some shorts I need to hem, thanks for the tips! Hate doing that ... Nice tip to use safety pins! I know how to hand-sew but I am afraid mine will not come off as neat as yours, I have cropped pants, shorts, regular pants and skirts that need to be hemmed or re-hemmed. Hmmm.